Well there goes another Father’s Day and here’s hoping everyone had as good weekend with their kids as I did with my mine. 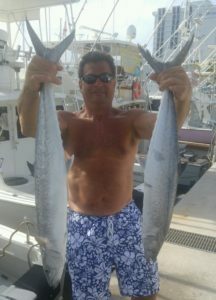 Special day and a also a special thanks to those kids and families who purchased those Marlin My Darlin Gift Certificates for a Ft. Lauderdale fishing charter for Dad this weekend. We had a fun time here with good fishing, some calm weather offshore, and just enough breeze to take the edge off the heat without too much wave action. 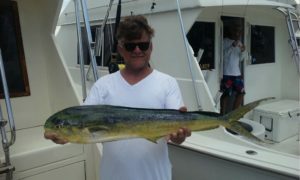 Summer time Kings and Mahi-Mahi continue to be very good target species on our fishing charters. 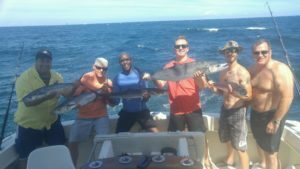 As expected the Bonito continue to stream through the area and when we can find the Blackfin Tuna we have had good catches of the small to medium sized fish with an occasional big boy. We often try to focus in on the medium sized fish (smaller ones do get fooled too) to keep the fish coming as opposed to fishing for the less frequent big fish bite. This has been a strong year for the Tunas. The Mahi-Mahi continue to be offshore and it has been nice as these fish certainly were late in arriving in our fishing area this year. Let’s not look back at their erratic visits up to now and enjoy them , better late than never. The strong numbers from two days ago are down and we feel that is because they have moved deeper, considerably deeper, what with the current slowing considerably. But they are still in the picture and will be targeted this week. The Kingfish have continued to bite well with both morning and afternoons producing some good fish regardless to the speed of the current and most are better than average sized school fish, but an exceptionally fat 26 pounder did hit the ice. They have been hot on the Stan Ruer mylar based witches fished with paper thin Bonito strips that we cut daily from the sides of those summer Bonito we are catching. We are leaning heavily on trolling approaches regardless if the species is Mahi-Mahi, Tuna or King Mackerel as the disparity between trolling bites versus live baiting bites is substantial. Tight lines and good fishing from Rick, Matt, Tommy K and JJ aboard the Marlin my Darlin. Garrett will be rejoining us next week for our busy summer season which is now in full swing.